Arrow 5016N – Adjustable for spring sizes 1-6. 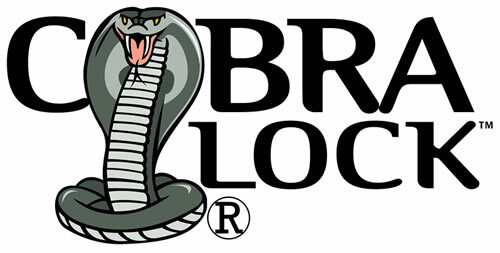 Meets 5lbs., maximum opening force for interior doors, and 8.5lbs., maximum opening force for exterior doors. Non-Handed for different types of applications. Four different finishes are available. The 5106N is considered Grade 1 certified and meets the ADA for barrier free accessibility. Arrow 914N – Adjustable for spring sizes 1-4. Meets 5lbs., maximum opening force for interior doors, and 8.5lbs., maximum opening force for exterior doors. Grade 1 certified and meets ADA for barrier free accessibility. 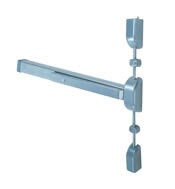 Non-Handed for installation on the top jamb and parallel mount applications. Available in five different finishes. Arrow S1000 Exit Device is constructed of pressure formed non-ferrous alloy, with cold drawn brass, bronze or stainless steel. Fits standard 1-3/4" thick doors. 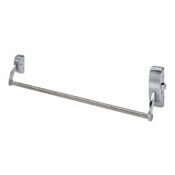 The crossbars are made of brass and stainless steel with a .062" steel tubing. Six different finishes are available. Grade 1 ANSI compliant. Handing is reversible. 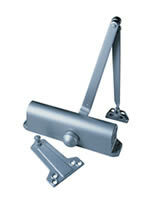 Fits door thickness of 1-3/4"
Arrow S1150 Vertical Rod Exit Devices are Grade 1 certified and UL listed. Constructed of non-ferrous alloy with metal end caps. Comes with reversible handing. Top and bottom latch-bolts are made of brass with the rail assemble made of steel. Fits standard 1-3/4" doors. 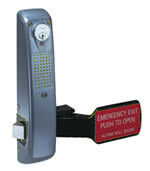 Arrow 300 Series Exit Alarms are designed to operate on a 9 volt battery. The frame is made of non-ferrous metal alloy. 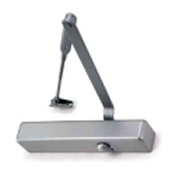 The 3/4" latch-bolt is monitored by an electronic sensor switch. An unauthorized movement on the latch-bolt will cause the alarm to go off. Alarm sounds for 2 minutes then automatically shuts off. Lock cylinders are ordered separately.